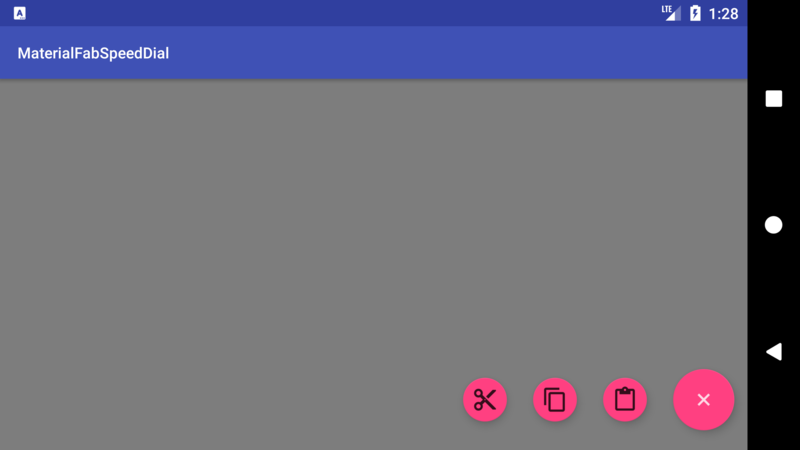 This project aims to provide FloatingActionButton's speed dial pattern in material design guideline. This project is inspired by fab-speed-dial and overcomes some issues of it (ex. using private APIs of support library). This library supports landscape mode and also supports CoordinatorLayout so it works as same as FloatingActionButton when Snackbar is shown. You can also use snapshot version. Version 2 is major update and has some big changes. If you don't want to use v2, please use 1.2.1 instead. You can put FabSpeedDial in your layout XML. Menu file is as below. Supported attributes of menu are id, title, icon, orderInCategory, visible, enabled. Other attributes will be ignored. Or you can set up menu items programmatically. You can detect menu open/close event and menu item click event. fab_extraMargin dimension Extra margin between FABs All FABs have padding app:useCompatPadding="true". To reduce space, set negative value. fab_miniFab***List attribute is array version of fab_miniFab***. If you want to set different values to each items, please use fab_miniFab***List instead of fab_miniFab***. Notice that size of resource array must be same as menu item size. In Android 4.x, there is an issue about selector of vector drawable XML. If you want to use such XML, according to this StackOverflow, you need to add the following snippet in your Activity classes.